NEW BRITAIN - One by one they crossed the finish line in succession and came to a gradual stop before looking at the clock. They liked what they saw. For Chaz Williams, Carlos Villarini and Jonathan Rodriguez, a trio of New Britain natives, there’s something special about track and field. Williams, Villarini and Rodriguez each took place in the Nutmeg Games’ event on their home track at Veterans Stadium. Williams finished first (15.91), then Villarini (16.10) and Rodriguez (16.16). But perhaps just as important as their times is the trio puts in the work to go along with that success. Williams is a rising senior at New Britain High School. During the Class LL meet, he finished sixth in the 110 hurdles with a time of 15.74 and then fifth in the 300 hurdles with a time of 41.38. For Williams, the results are a culmination of the hard work he first started putting in when he began running track in sixth grade and then started hurdles in seventh. At the State Open he placed 10th during the 300 hurdles with a time of 40.74. Rodriguez initially started track to stay in shape for his other sports, little did he know he would end up liking it a lot more than he thought. “When my coach came up to me and told me I had potential, I took it more seriously and took a more competitive approach,” Rodriguez said. Rodriguez is a rising senior at The Academy of Science and Innovation. But for him, the sport revolves around his mentality and wanting to be the best. 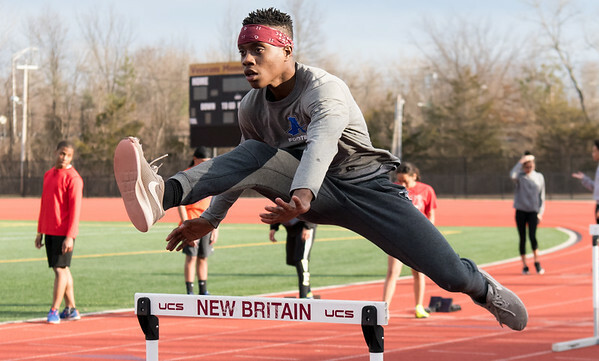 “To have the mentality to keep pushing forward and keep working hard and to keep improving yourself as you go on throughout the years,” said Rodriguez, who won the CRAL championship in the 110 hurdles and later placed fourth in Class S with a time of 15.84. Villarini is a recent graduate of New Britain High School. In the fall, he will be continuing his track career at Central Connecticut State University. Yet Villarini didn’t always plan on running track in college. It was more something just to do. As the meets went on, and Villarini put in the work, New Britain track and field coach Tim Kolodziej told him he saw potential. Villarini hasn’t stopped since. Posted in New Britain Herald, General Sports, New Britain on Saturday, 14 July 2018 19:20. Updated: Saturday, 14 July 2018 19:22.